Heeeeey! Thanks so much for stopping by! Let’s jump right in shall we? 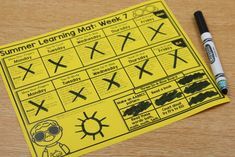 In my classroom I’ve always tried to teach to the standards as you know…some of them forwards, backwards and even in circles HA! However, there are some standards that for sure took a backseat *cough, cough, cough* HEALTH STANDARDS! 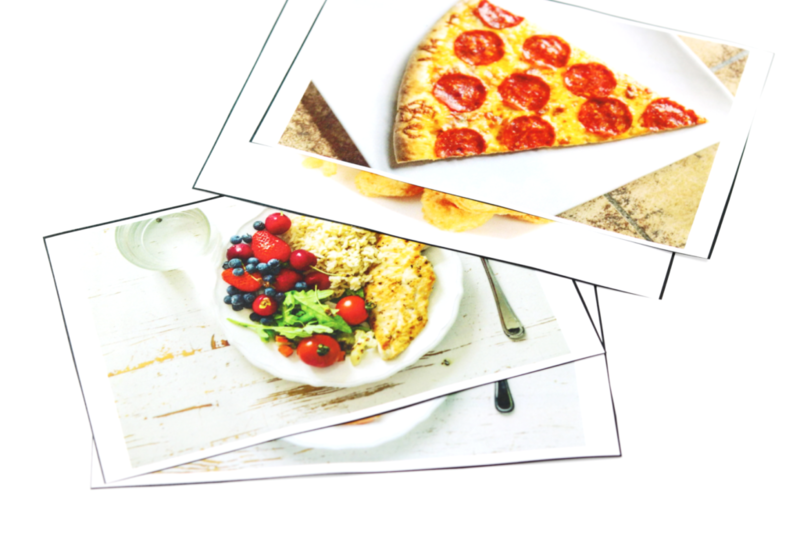 I mean sure we talk about healthy food and exercising but what about all those in between? Well, I enjoy teaching to the standards only when I have FUN and MEANINGFUL curriculum! Do I really want to teach standards from a 1980’s manual? No. Do the kids want to? Well, technically they didn’t have a say but I will answer for them, NO! 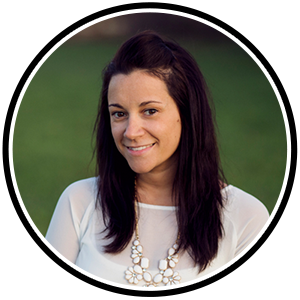 So, I am really excited to get content based curriculum released! 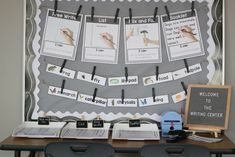 I always hope that teachers find the ease in my curriculum set up and take joy in that nearly everything is included… I mean insert some markers, paper and KIDS then you’re set! 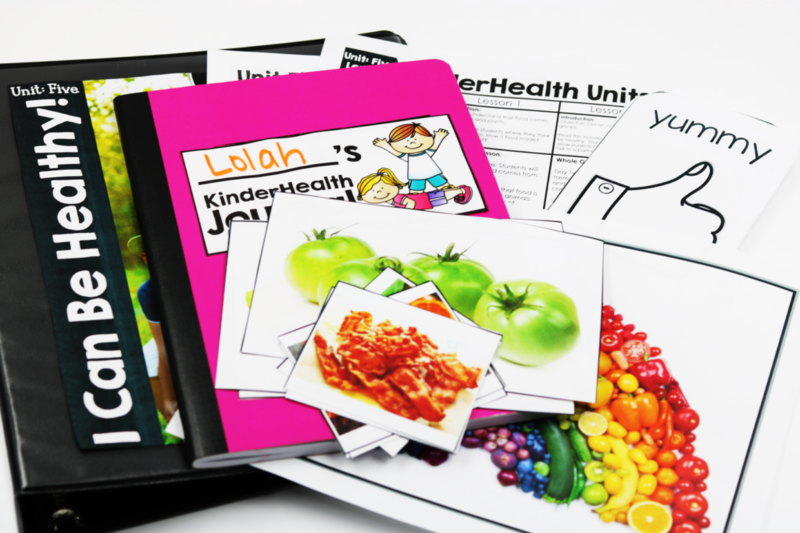 Today I will be sharing all about my Health curriculum! Now a couple quick housekeeping notes before we jump in! 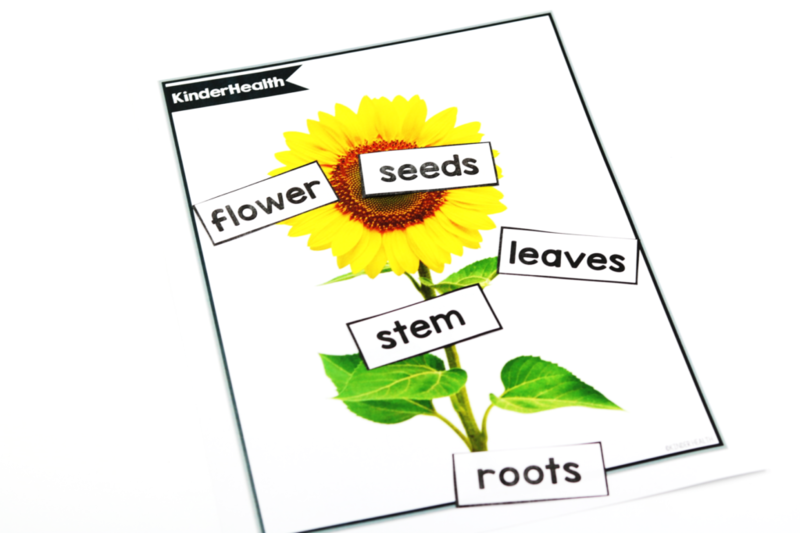 First, this curriculum is called KinderCurriculum. 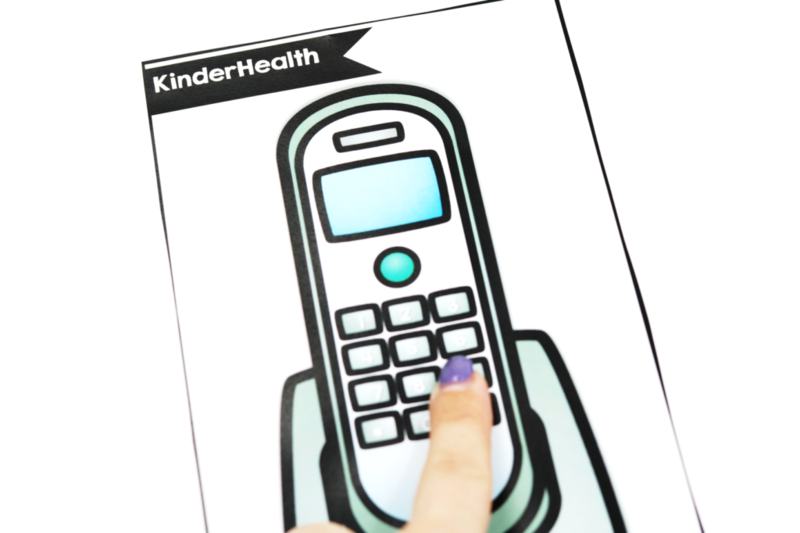 That immediately makes you think, “Oh, so this is JUST for Kinder?” Well, yes and no! 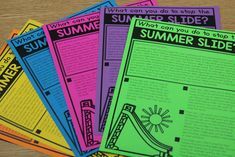 First off, I never want to mislead my curriculum and no doubt when I place the grade level name in the title…that simply means that this curriculum is best suited for that grade level! Well…that in when it comes to Trademarking it’s so much easier HA! I have added an “unbranded” version to this curriculum! 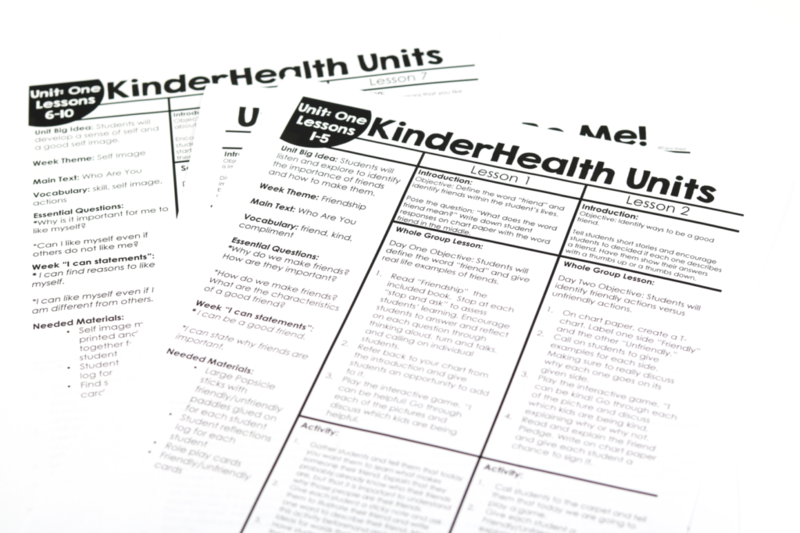 These pages are labeled with just “Health” instead if the ‘Kinder’ tag! 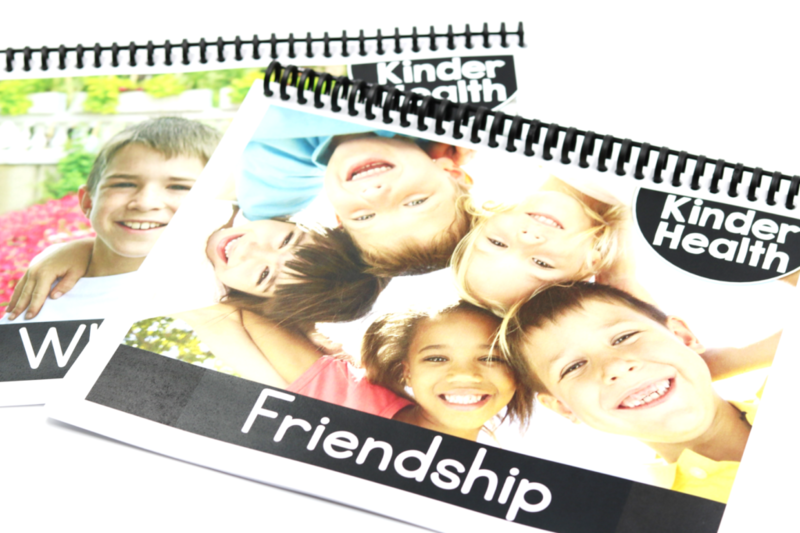 This helps those that teach PreK, Sped, First Grade, etc! Next, I wanted to get this post out because the bundle is currently 50% off! 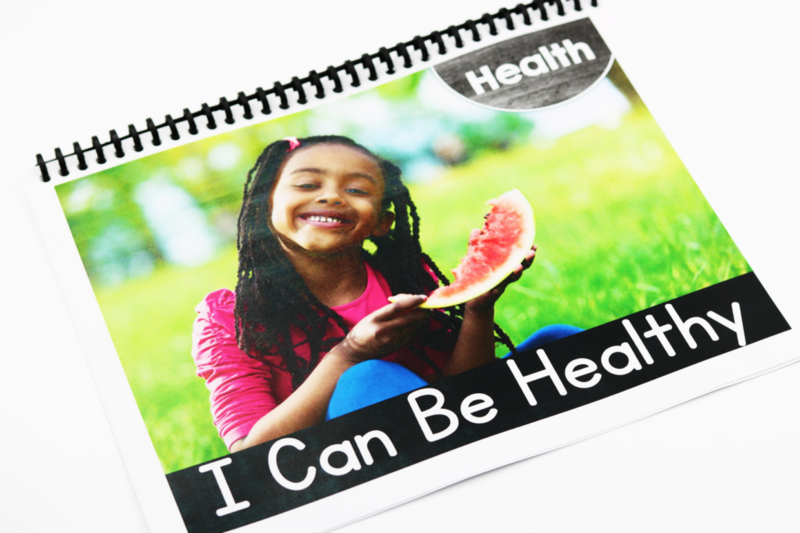 I will be increasing the price after the start of the new month because this curriculum is no longer growing! 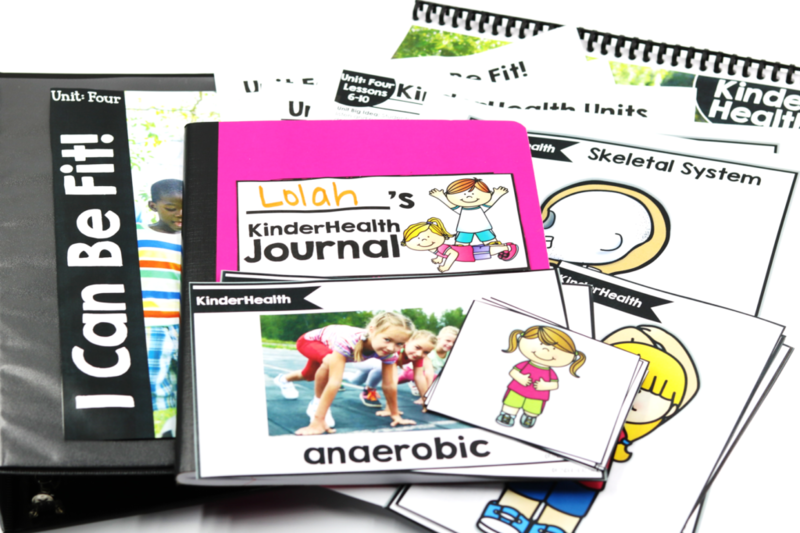 Each unit consists of two weeks worth of lesson plans! You can of course extend each day into 2-3 days! 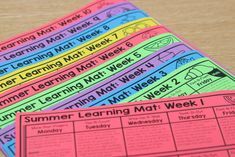 In total the curriculum will get you through 10 weeks of instruction! Let’s start with unit one! 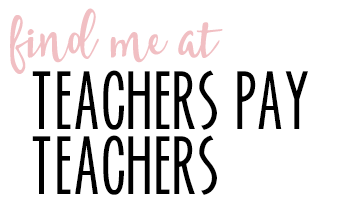 You can see below that each week you get true teacher explicit lesson plans! 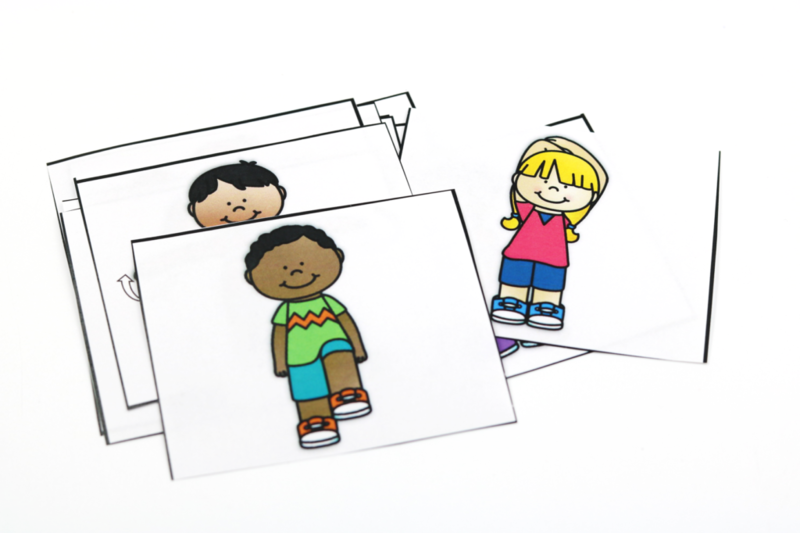 Each day the lesson has an introduction, whole-group lesson. 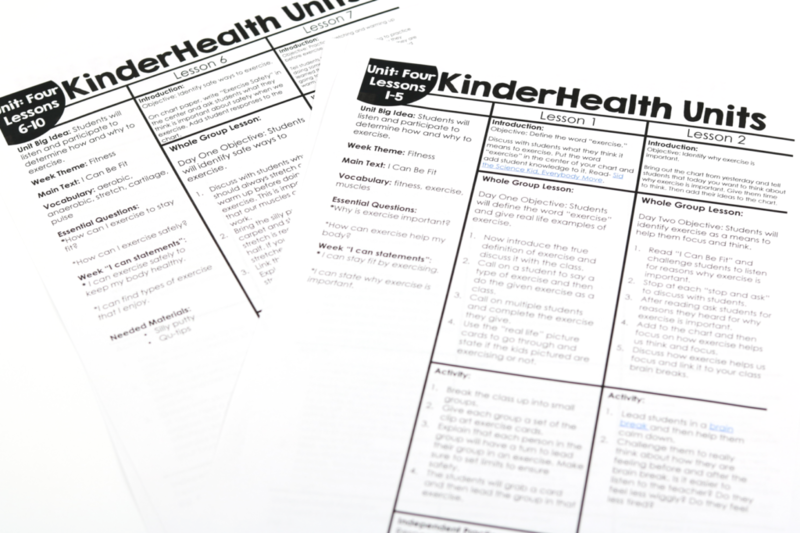 activity and follow-up independent practice sheet! 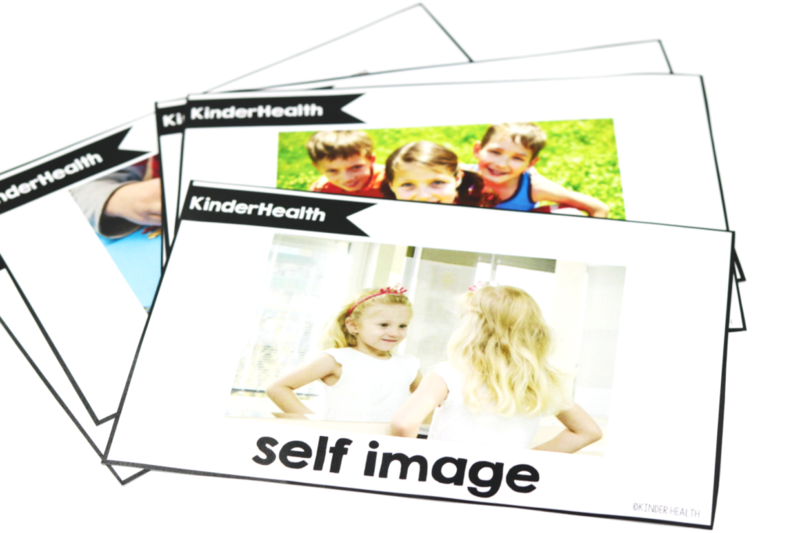 Each unit you are also provided with vocabulary cards. In Unit 1, we are learning about ourselves and being a kind friend as well! 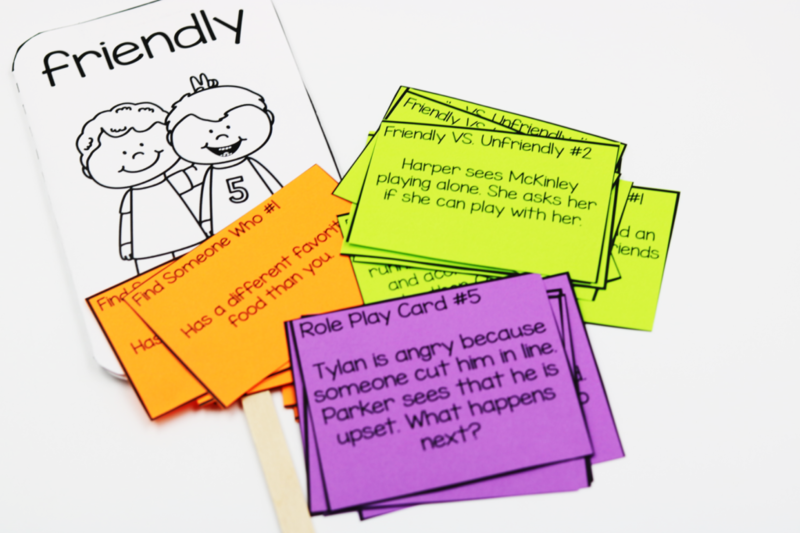 In the activity below, the kids will determine if the kids in each situation are being friendly or not using the answer paddle! Each unit also comes with whole-group read alouds! 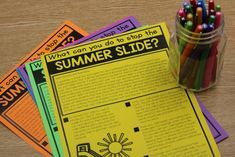 You can print these like below or simply read them from your interactive whiteboard. 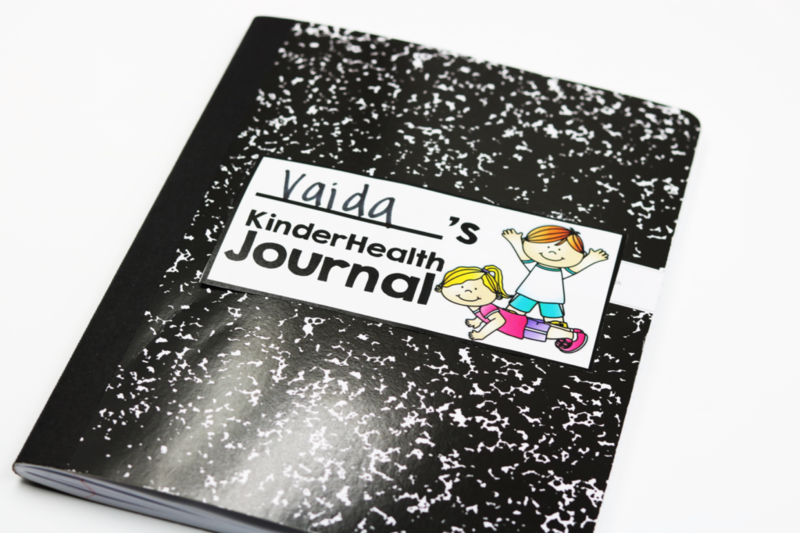 If you choose, you can also have the kiddos keep a health notebook! 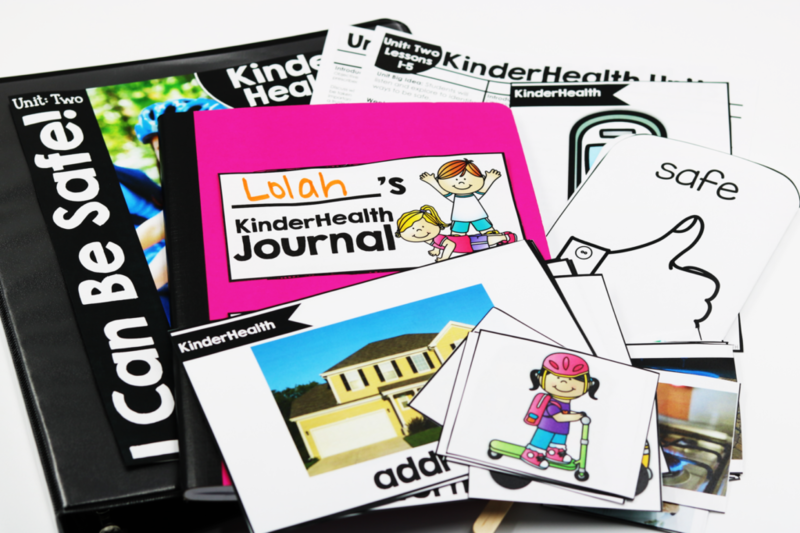 I share how to print the practice sheets so that they can fit inside! 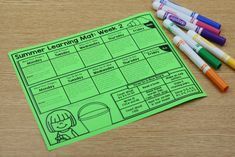 This is great so that the kiddos can see their learning progress over the units. Here is a look at one of the practice sheets that has been formatted to fit inside the notebook. Let’s move onto unit 2! 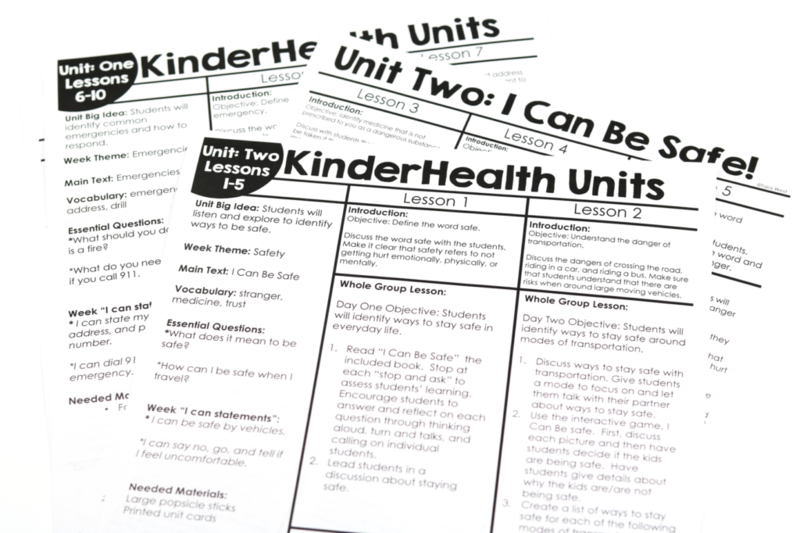 Unit 2 of KinderHealth is all about being safe! 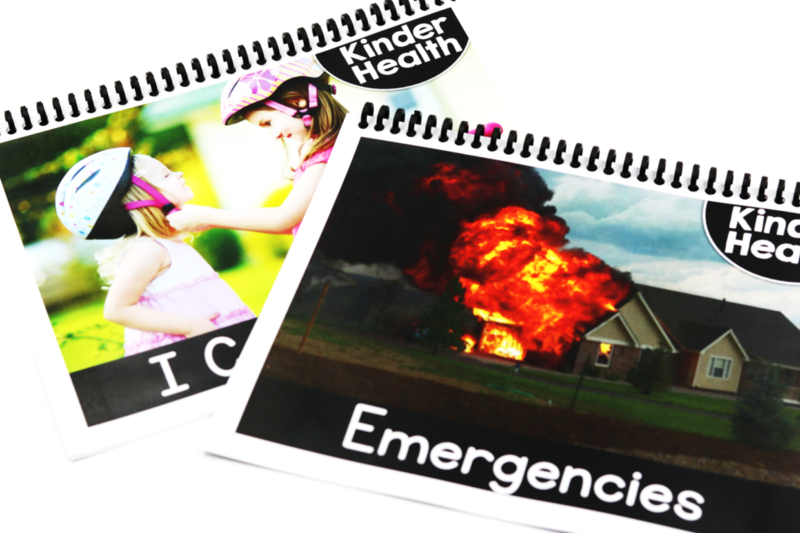 The students will learn about safety in a variety of situations like transportation, medicine, household items, emergencies and more! Below is a look at unit 2’s lesson plans! 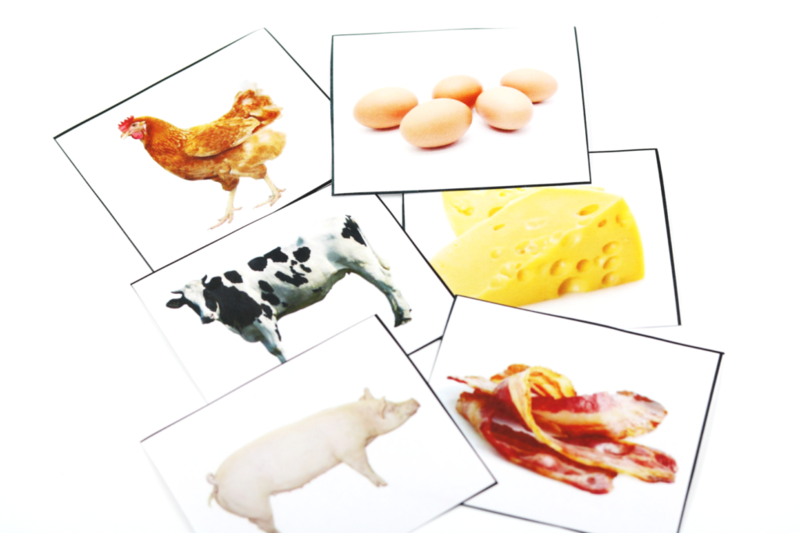 Unit 2’s vocabulary picture cards. 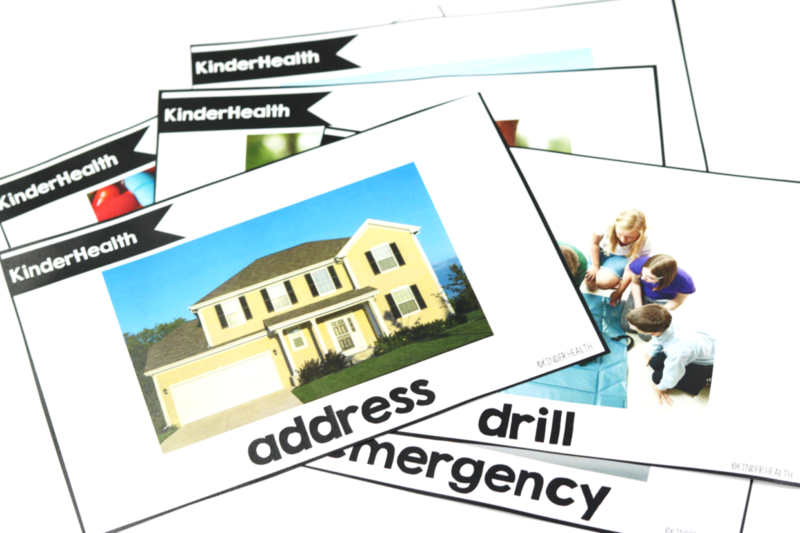 We also spend time practicing the purpose of 911 and how and WHEN to dial! The kids are equipped with a safe and unsafe paddle that they use across the unit! 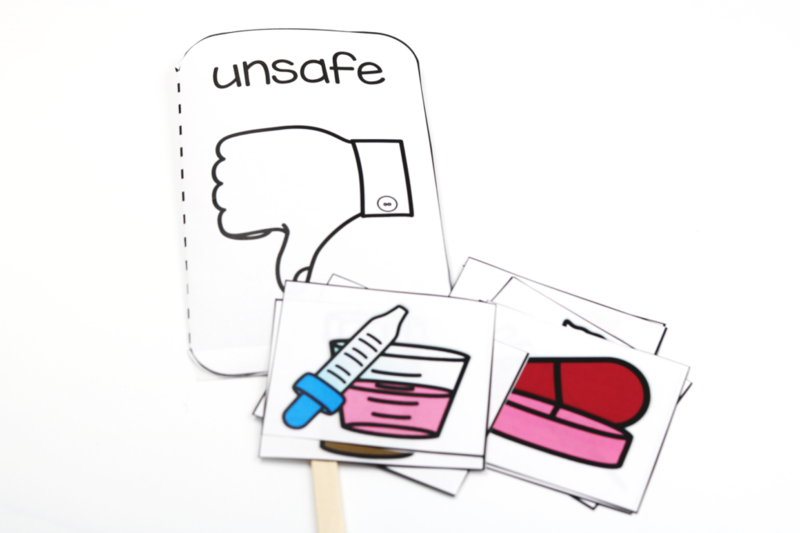 Pictured below, the students will let you know which items are safe (medicine and kid-unfriendly items are shown). 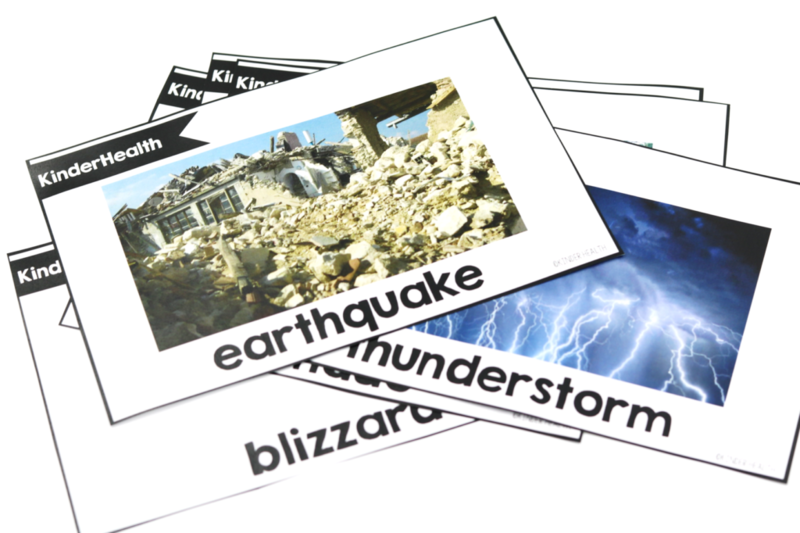 Natural disasters are also covered so that students understand how to respond to the emergency. Of course you could just cover those that are possible in your region. Below you see the use of the safe and unsafe paddle. 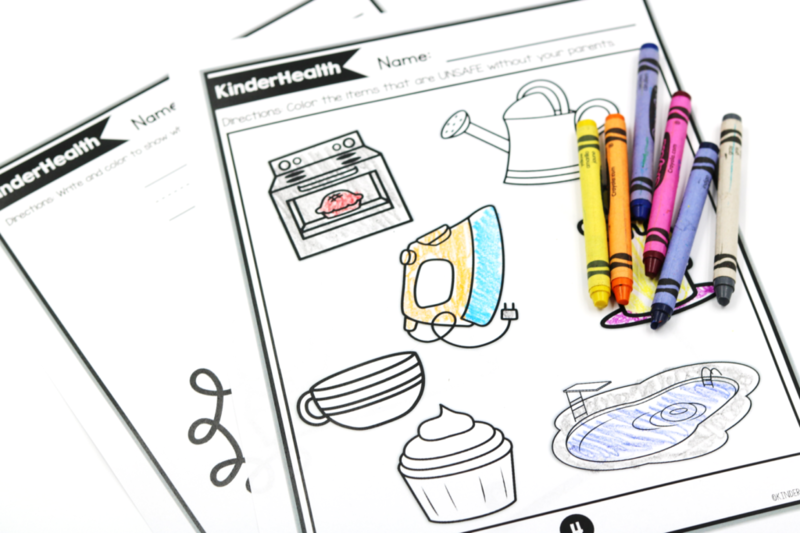 This time the students will view household scenarios (lit stove or mom and kid cooking together). As in Unit 1… there are two class read aloud books included for Unit 2. 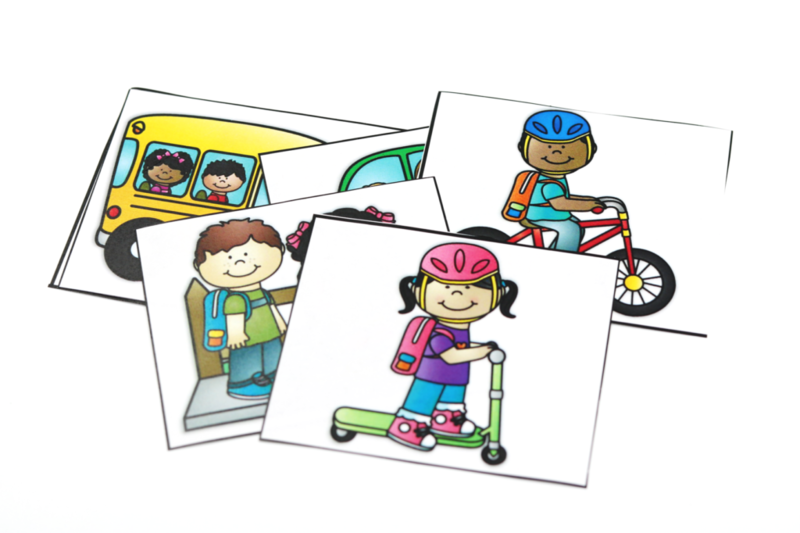 In unit 2 students will also practice and discuss how to be safe around variety modes of transportation. A look at one of unit 2’s practice sheets! 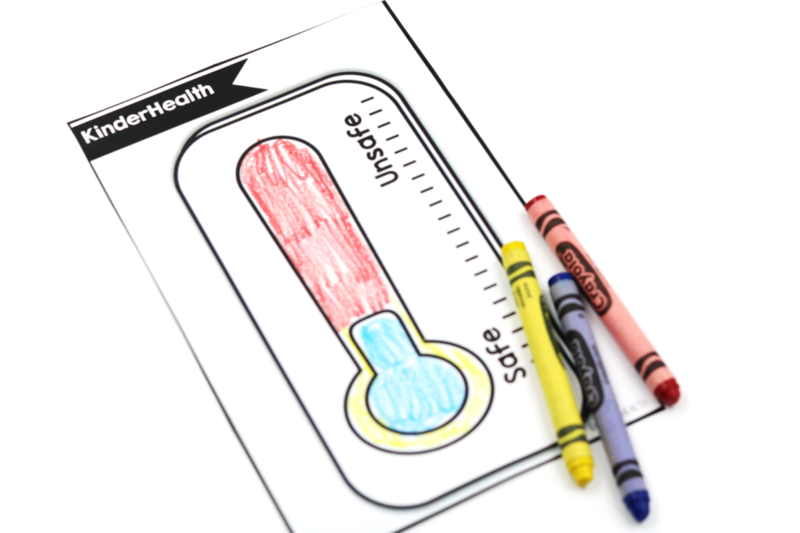 In this activity the students create a thermometer to take home! 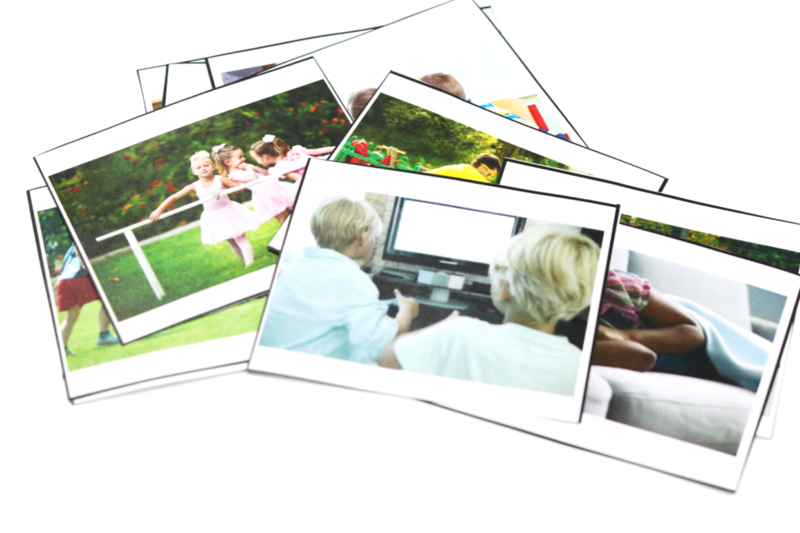 They work with their parents to walk around the house and discuss items that are and are not safe to touch. Let’s cruise onto unit 3! 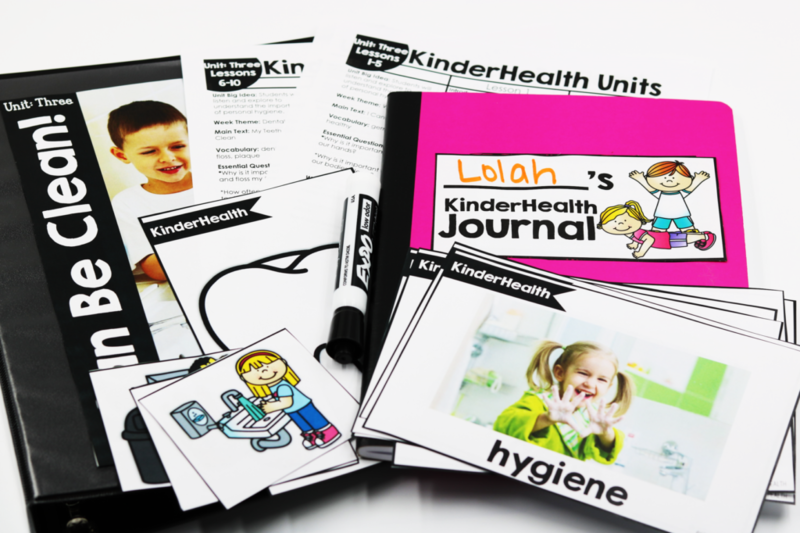 Unit 3 is all about hygiene! 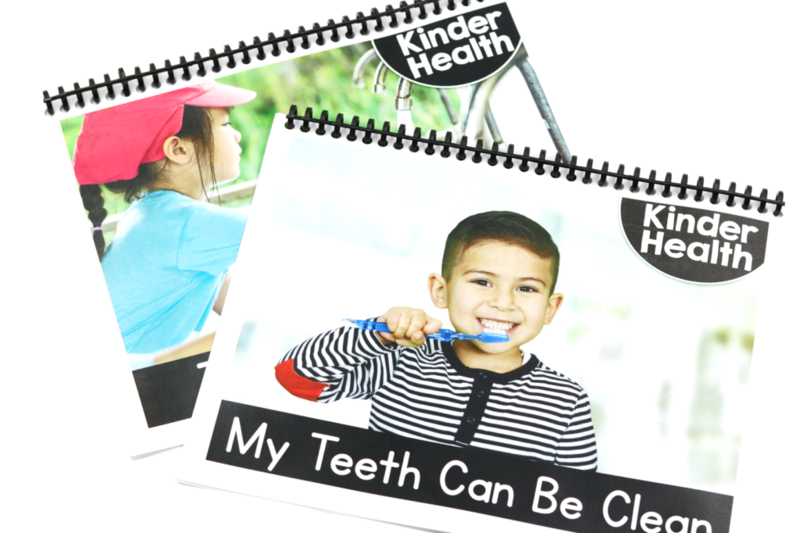 The students will learn about keeping their bodies clean and take a close look at dental hygiene! Below is a look at Unit 3’s lesson plans. 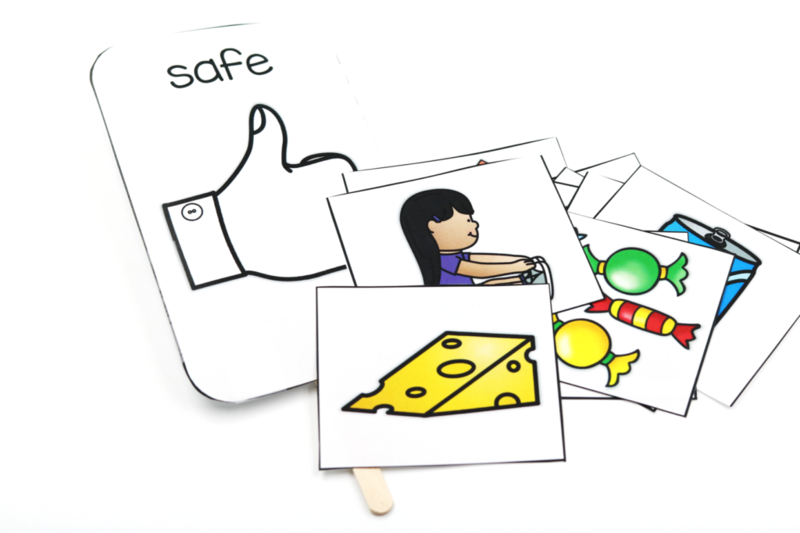 The included vocabulary cards for Unit 3! Unit 3’s whole-class read alouds! 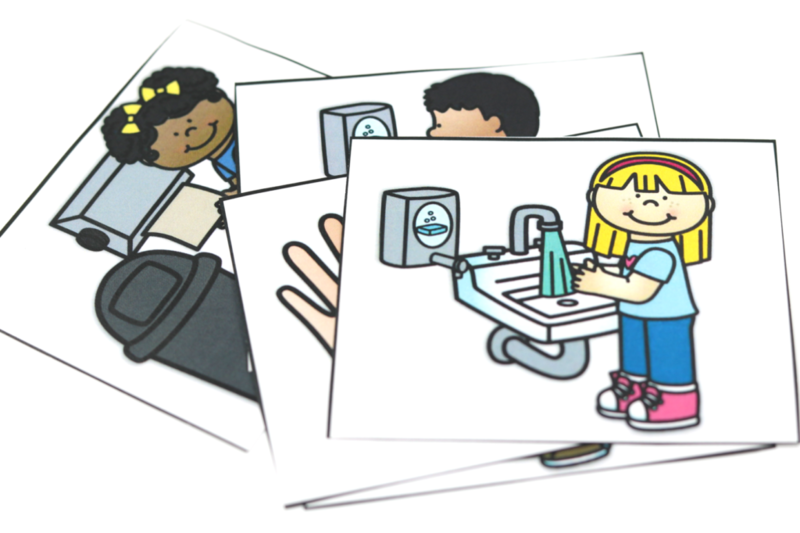 The students will help to sequence the proper steps to washing their hands! 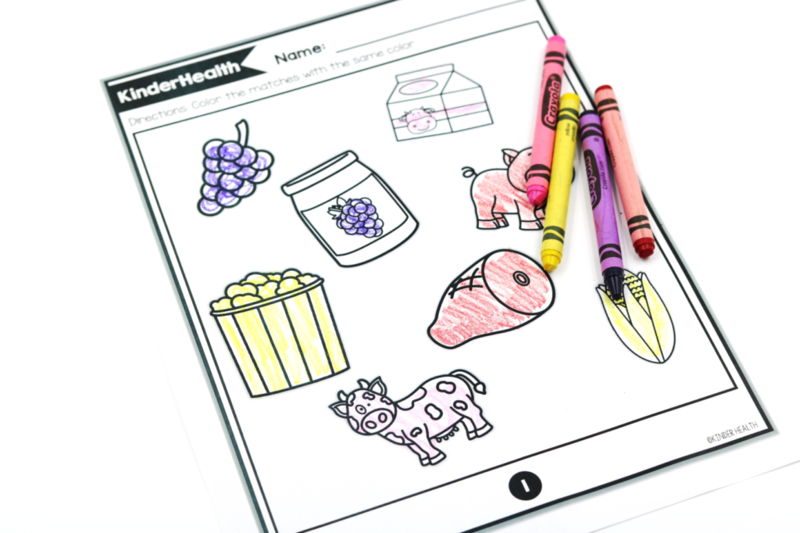 When it comes to dental hygiene the kiddos get to do some fun hands-on activities! How about this one? 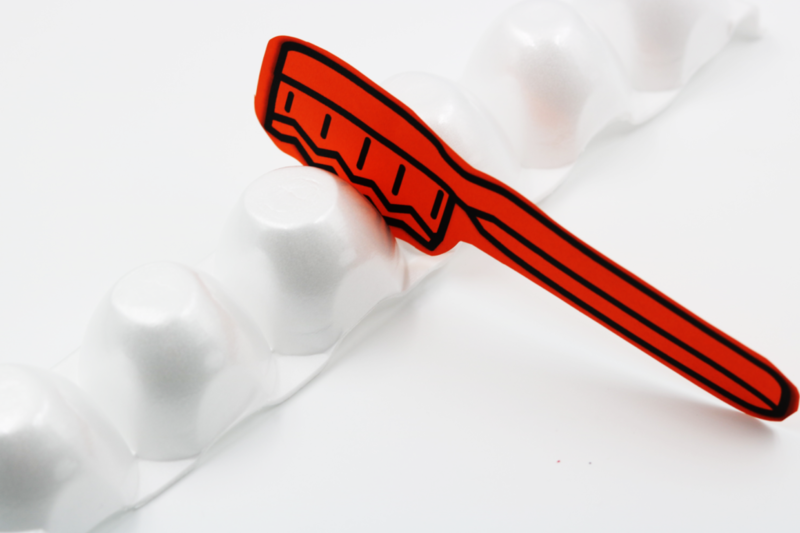 The kiddos use their toothbrush to practice brushing the “teeth”. The are able to use the same egg carton piece to practice flossing! 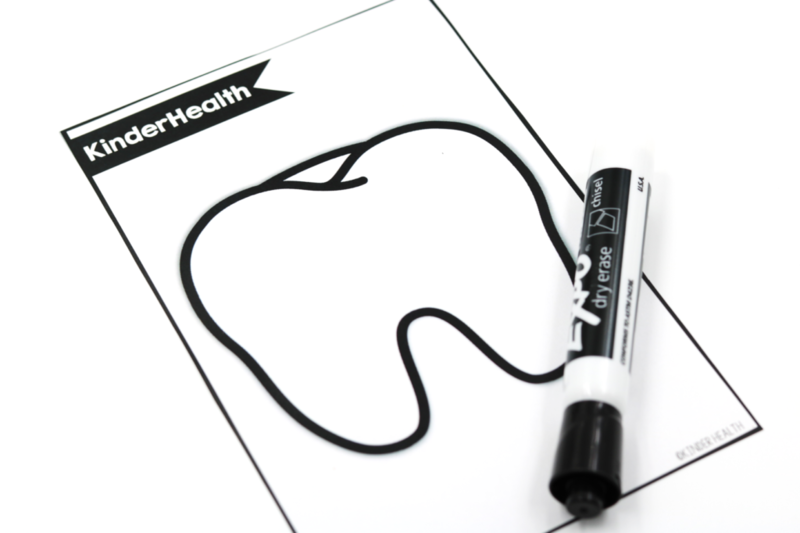 For this activity, the students are given a laminated tooth. You will state different daily occurrences (ate breakfast, had a sandwich at lunch, ate cookies after school) the students will make marks on the teeth to demonstrate the build up throughout the day. They will then have to work hard to clean it off! 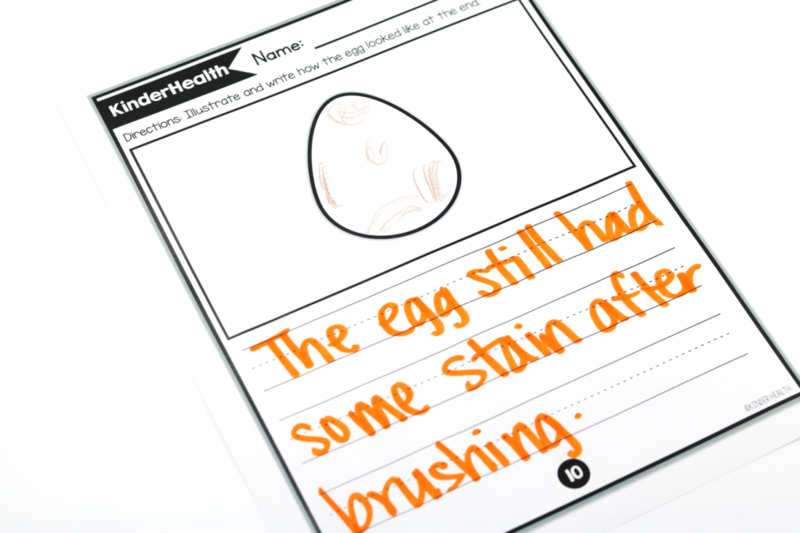 The recording sheet below is from a fun experiment where the kiddos see the effect of soda on a hard-boiled egg! Unit 4 is a fun one for sure! 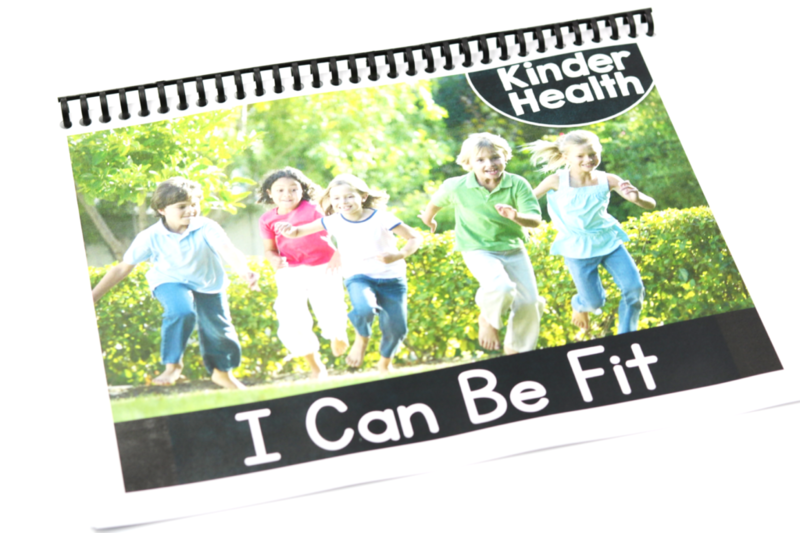 It’s all about being fit! 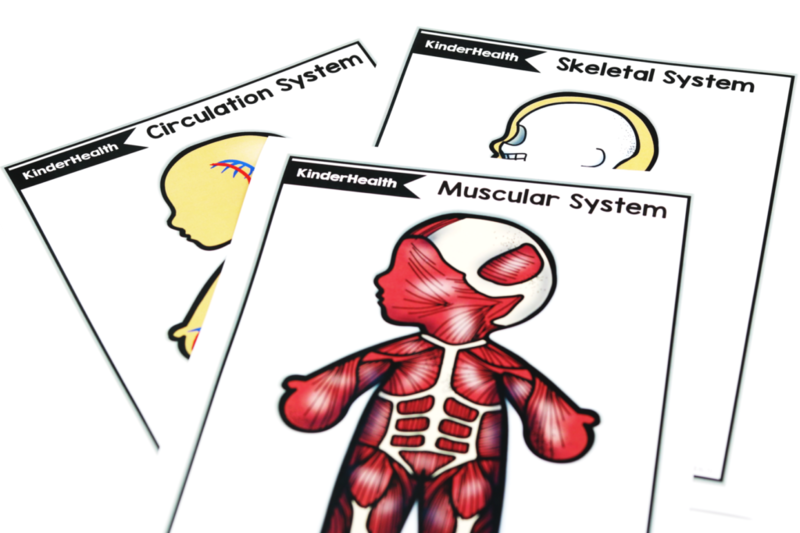 We also cover body systems and that is just TOO much fun! Unit 4 also has a whole-class read aloud book! 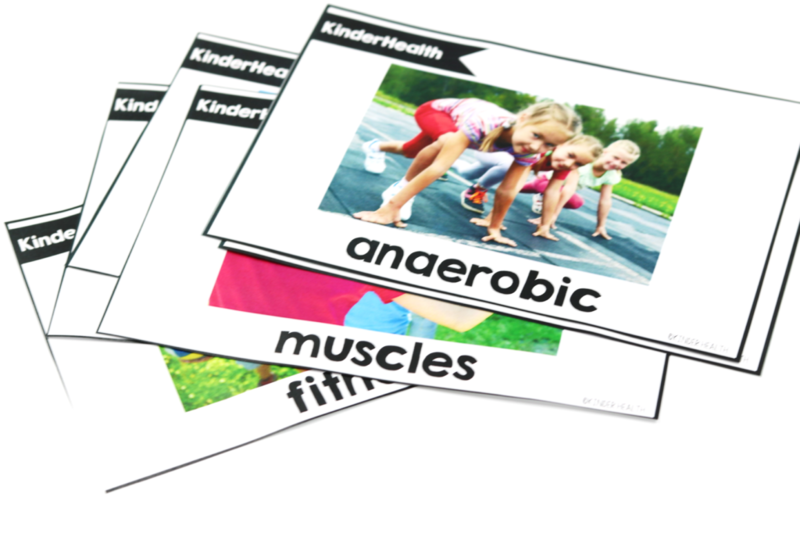 Unit 4 students will be recognizing what exercise is and sorting pictures to decide if the kids pictured are being “fit”. 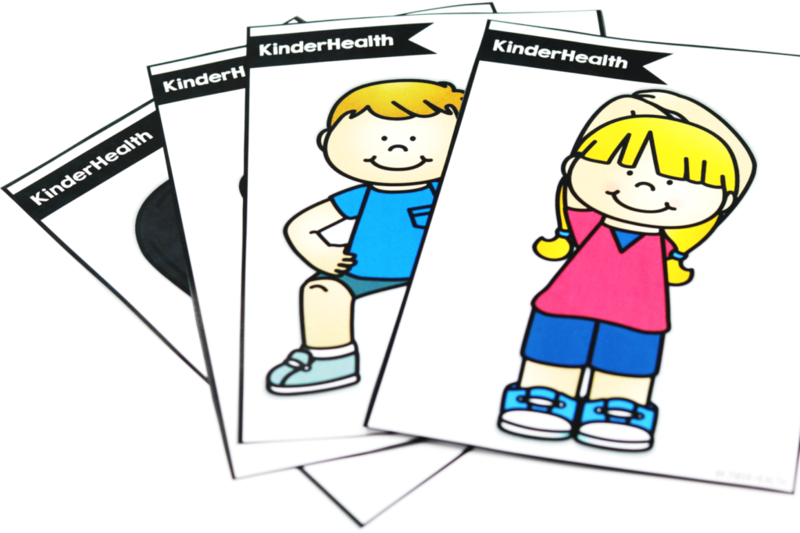 The students will get to try out some exercises with their classmates using the picture cards! We will also learn the importance of stretching and practice those as well! 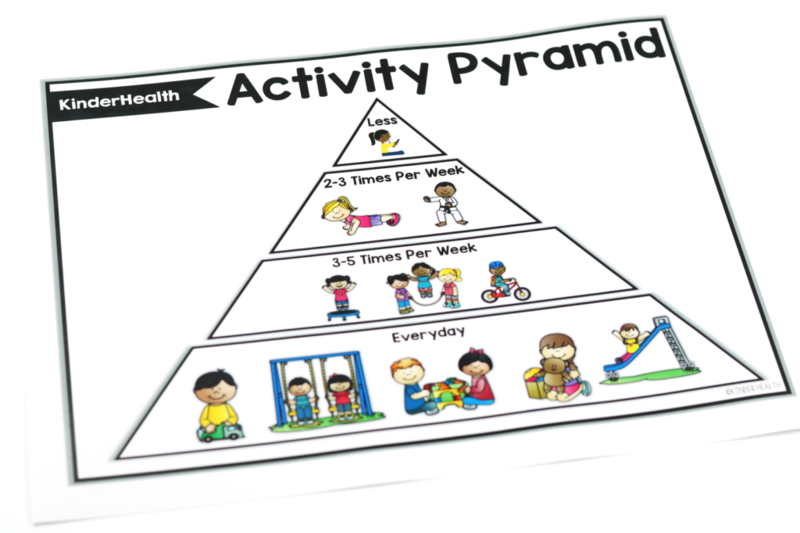 The students will be introduced to the activity pyramid! 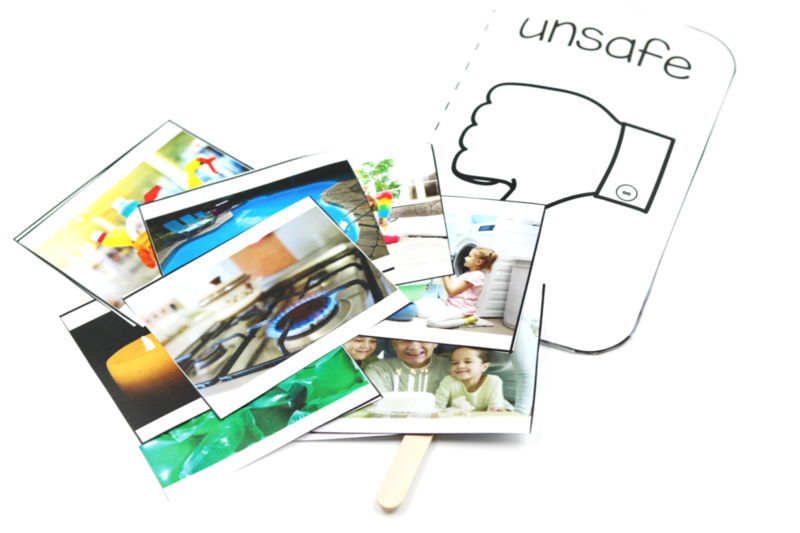 In Unit 4 the students will use their “safe” and “unsafe” paddles to determine was is safe for their bones! 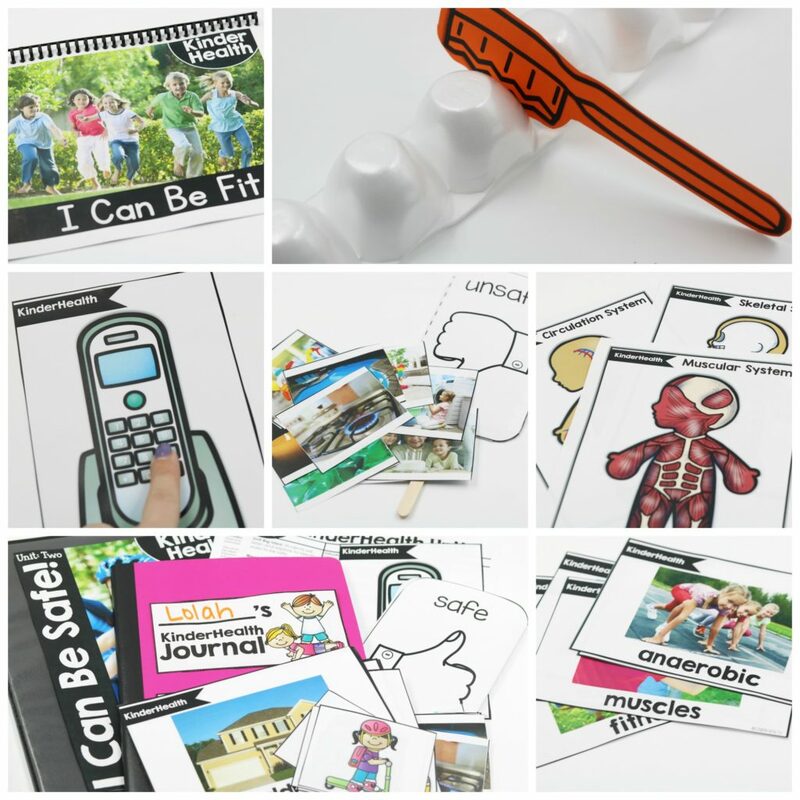 In Unit 4 we will be reading some awesome FREE books from Epic Books and learning about body systems! 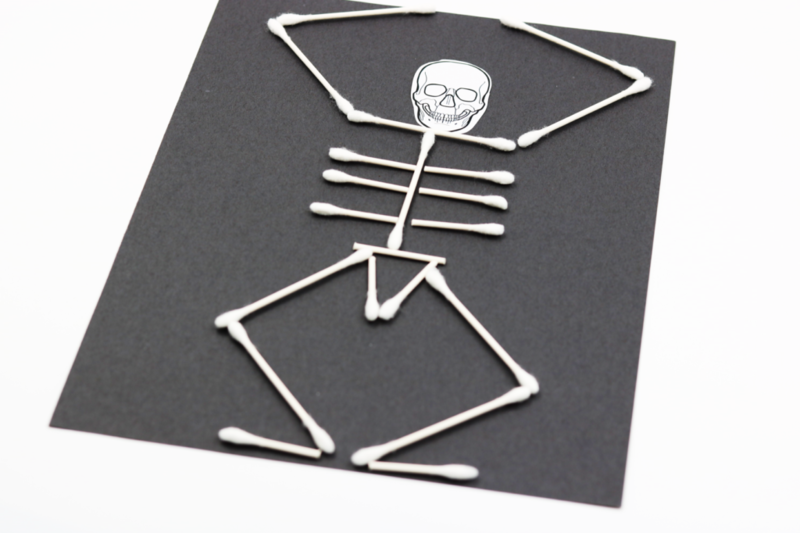 And a little skeleton craft that is just too much fun! Ha! 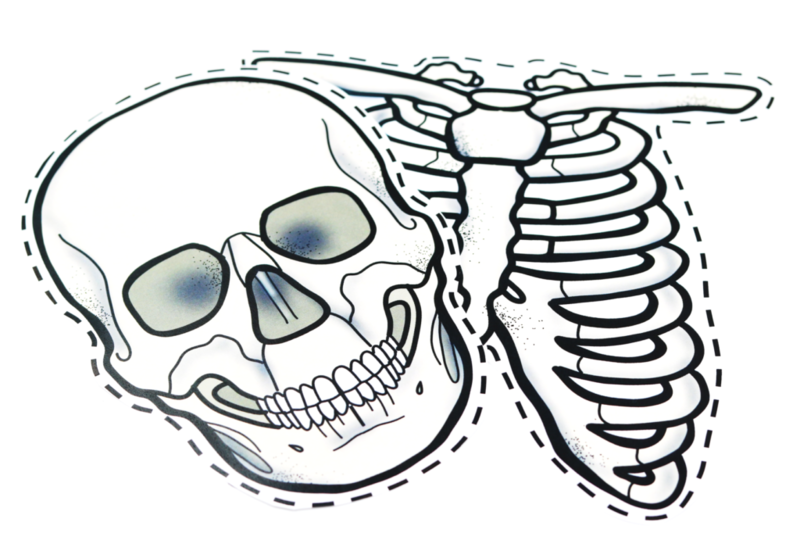 The students will also assist you in creating a “life-sized” skeleton! Below is a look at a practice sheets from unit 4! 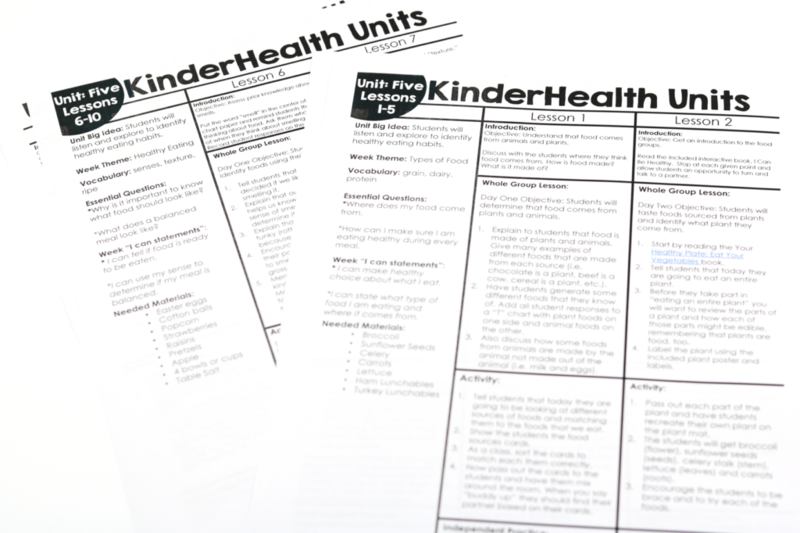 And last but not least….Unit 5! 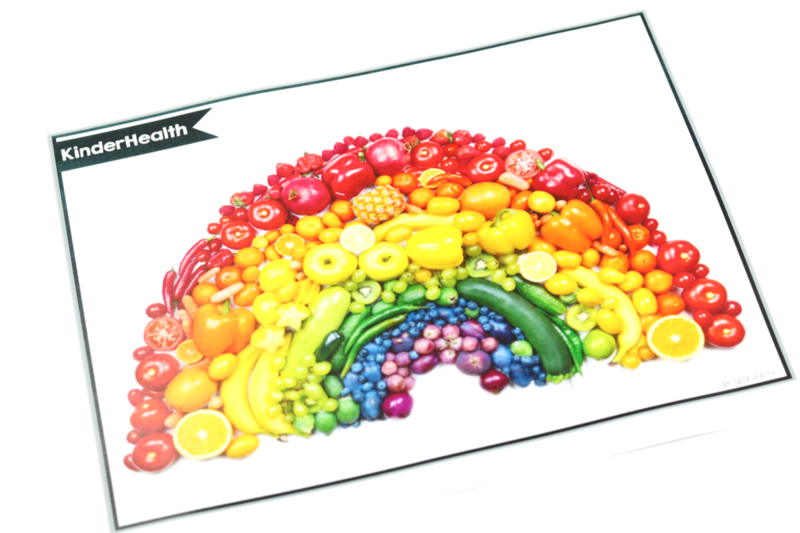 Unit 5 is all about eating healthy and making healthy choices! A look at Unit 5’s vocabulary cards! Unit 5 also contains a whole-class read aloud! 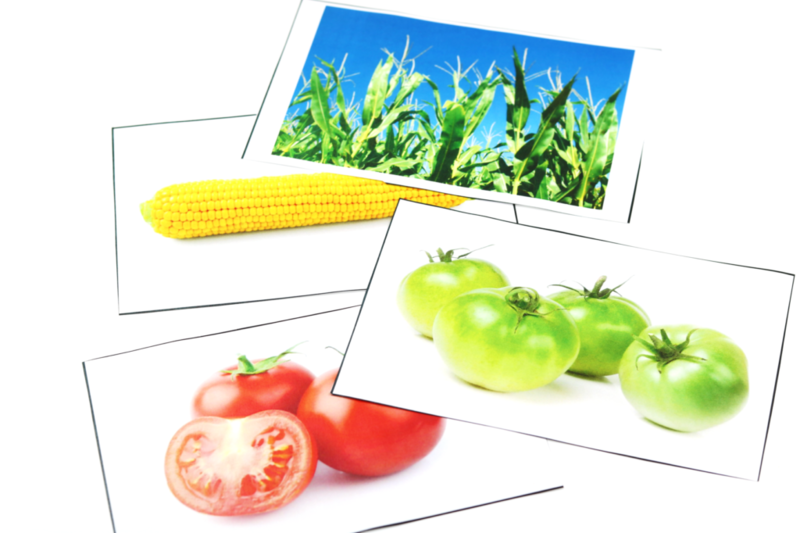 The students will first get a better understanding on where food comes from! They will be matching the food source to the animal! They will also have a chance to eat a “plant”. 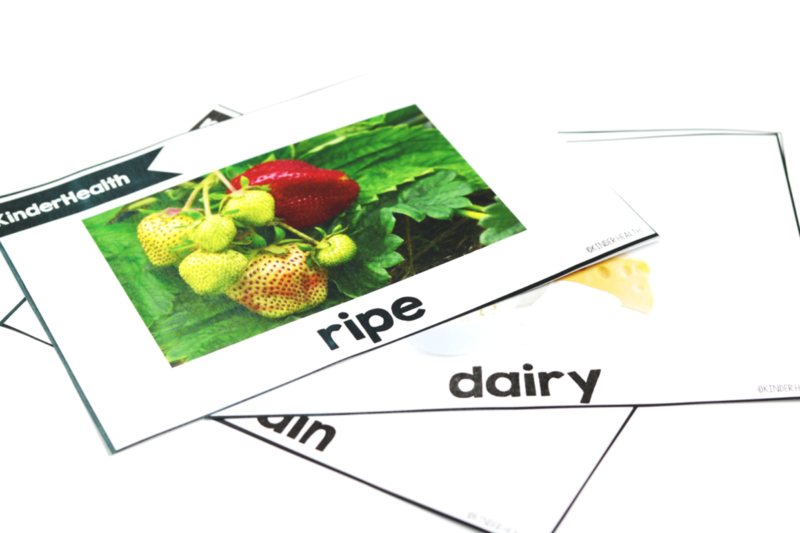 Students will also learn about safe foods to eat and what it means for a food to be “ripe”. 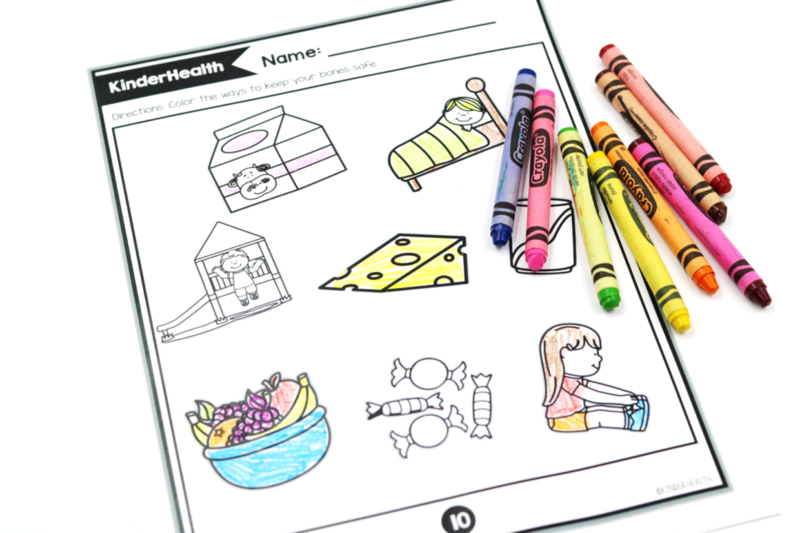 In unit 5 the kiddos will also get to see that the more colorful the food is, the healthier it is! 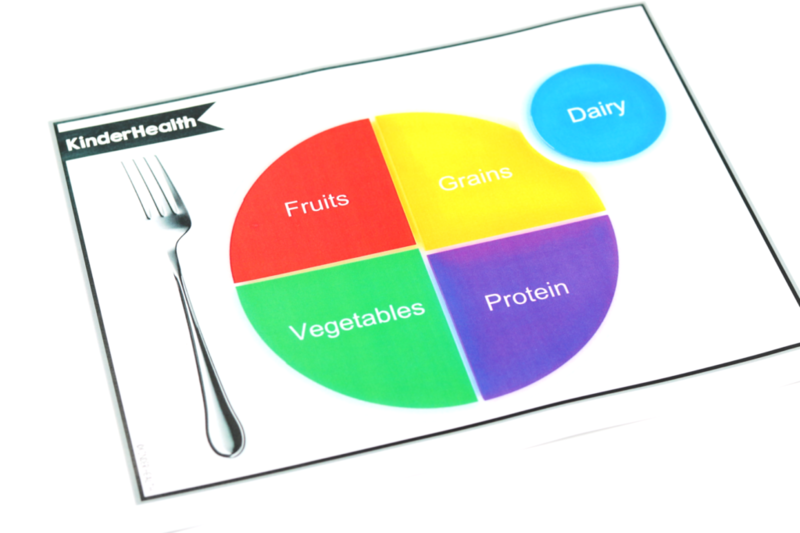 We will also cover what a healthy plate looks like and the proper serving sizes for each food group. 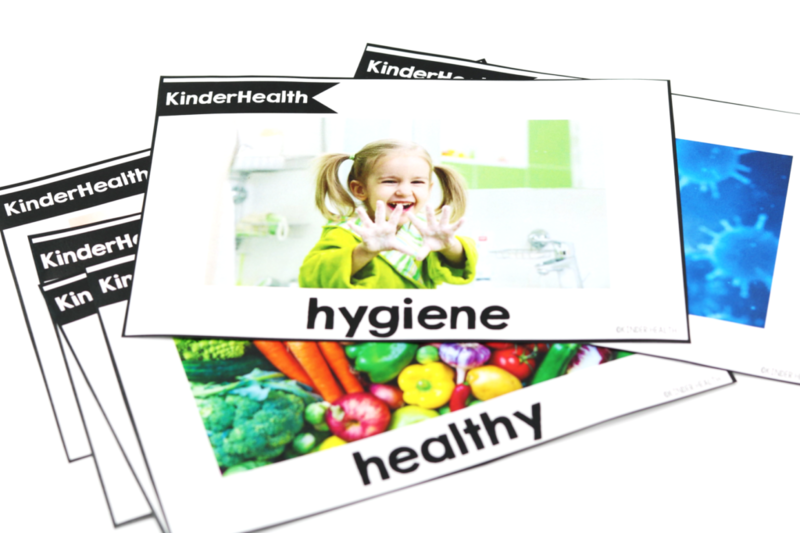 Students will then get to look at the food cards you show them and determine if they meet the health plate guidelines! 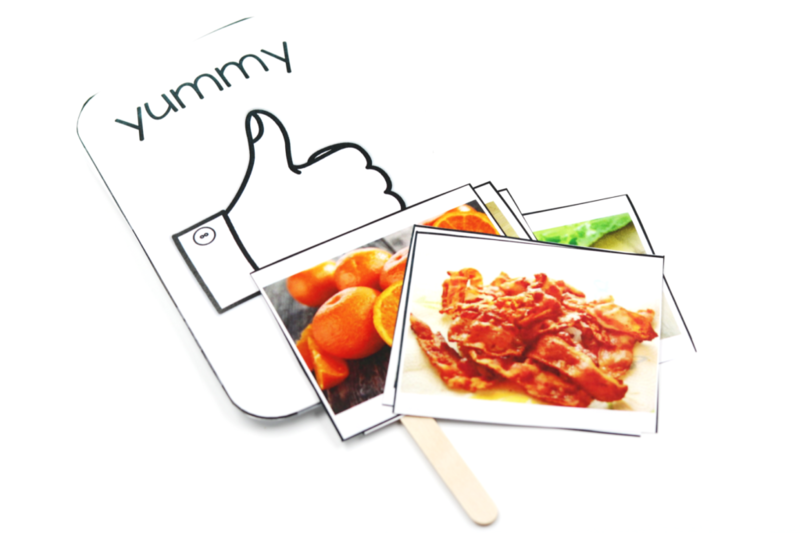 We will also give them a chance to state yummy and yucky foods according to their taste buds! 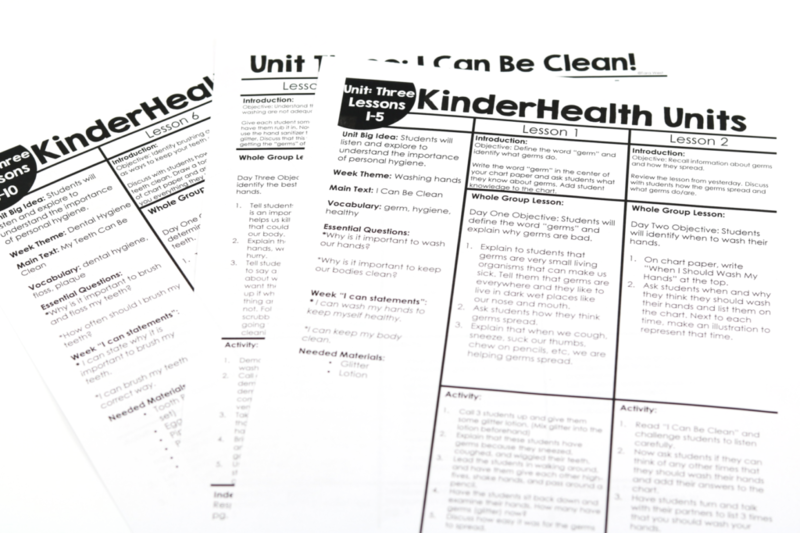 A look at a Unit 5 practice sheet! 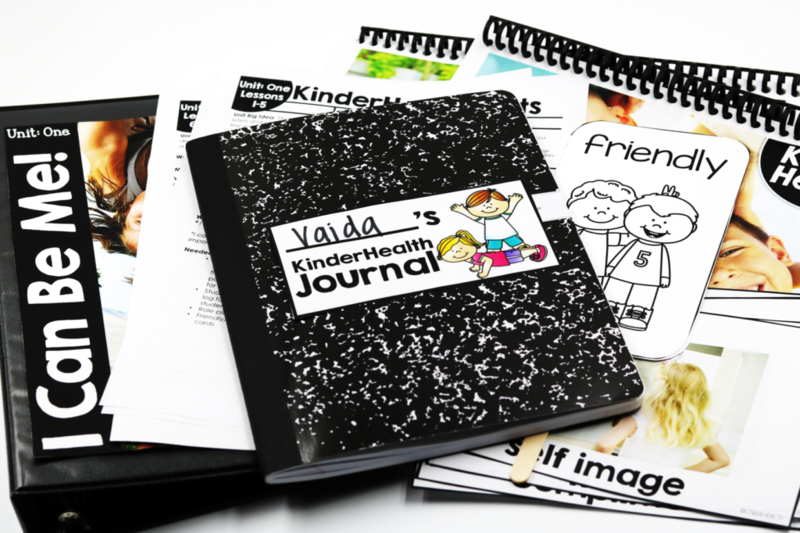 Again, KinderHealth (or insert grade level here) is on sale for 50% off through the end of the month! You can view the bundle HERE or clicking on image! 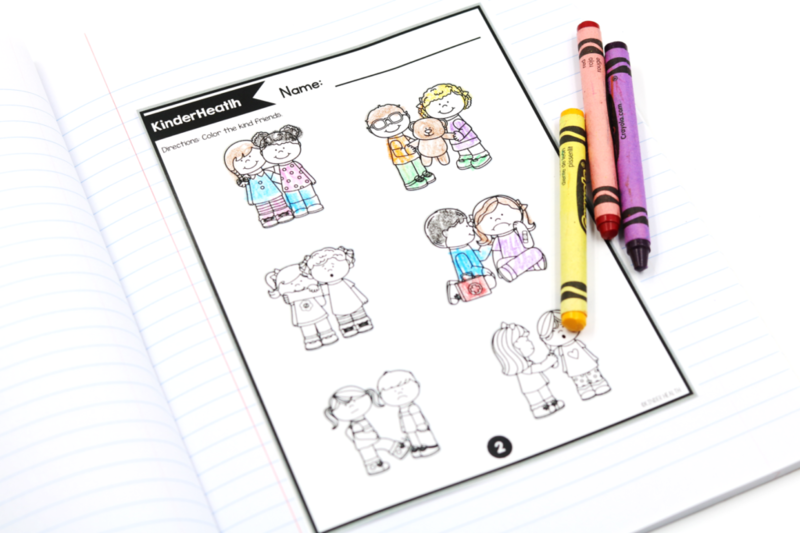 KinderMath: The Complete Math Curriculum 50% Off Sale! You make so many amazing things! How do you have the time?